Osram has released a package of four tools for luminaire designers, intended to encourage them to source Osram LEDs. There are rough edges. It's a good idea in theory: Make life much easier for designers if they use your chips. The press release promises an end to copying down numbers from LED data sheets to enter into local design tools. 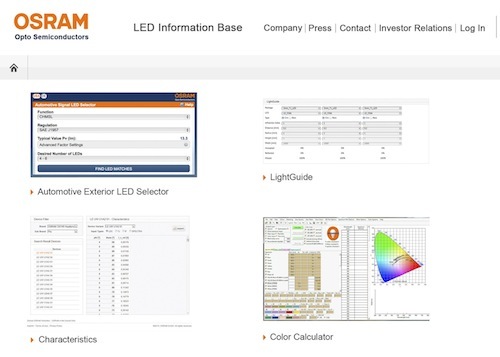 Osram's portal can download an Excel spreadsheet with all the relevant parameters once the designer has zeroed in on a solution. The first two are online apps that incorporate knowledge of Osram's full catalogue of visible-light LED sources. Color Calculator is a downloadable desktop app (after you provide personal information) for Windows or Macintosh. The last tool is -- I couldn't tell. It requires registration, and though I tried, I never received a confirming email to complete the process. The Color Calculator app on a Macintosh is beyond disappointing. It is not a Mac application; it is a very rough packaging of an X Windows application, which I presume represents a quick port from a Windows base. Long-time Mac fans do not look with favor upon such user-unfriendly shortcuts. The application didn't even begin to run on my Mac; it died before starting up. Color Calculator's documentation, as well as its version history, points to the depth of development behind this application. I have to assume it runs fine under Windows. The performance of the device comes first. It's nice after you pick an Osram device, but it won't make a designer (me, anyway) pick it over a better-performing or lower-cost solution. "Engineering is the science of making compromises." No app is going to replace the initial engineering rough-in, which includes counting the beans. What would be compelling is such a design portal that had up-to-date knowledge of more than one vendor's products. Imagine being able confidently to select the best LED options for a project among the offerings of Osram, Lumileds, Cree, and Nichia. But any single-vendor solution is not going to cut it -- especially not one as rough around the edges as Osram's first attempt.